Before people had video recorders it was easier to watch a series of self contained sketches rather tha follow a serial. 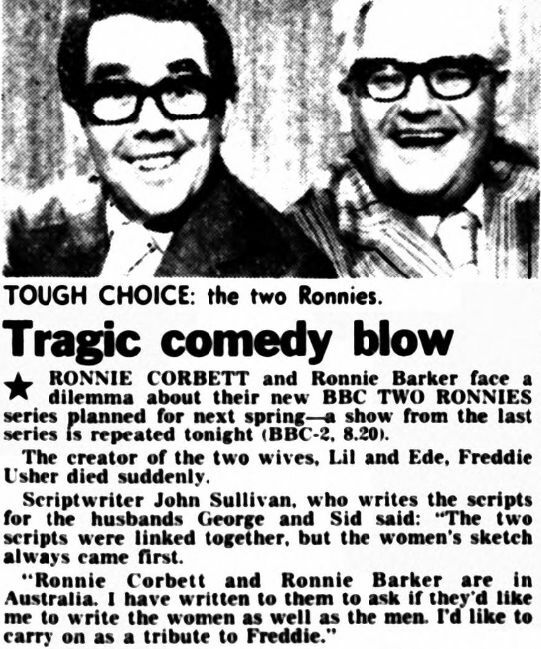 When John Sullivan died the BBC repeated an edition of The Two Ronnies as a tribute, and it was one from the 1978-79 series. I thought they chose this edition because it didn’t have an episode of a serial. I saw an interview with the legendary Michael Hurll, and he said that when he took over The Two Ronnies he didn’t try to change the format because it was already a winner. But he did make once change to the format, he dropped the serial in favour of the mini-movies. Prior to this series, all but one had featured a serial so I tend to lean towards budget issues being the season for the change this year – if the money had been available I would have expected a run of different filmed items as per the last few runs in the eighties. Although one benefit to dropping the serial is that it then becomes easier to repeat the odd episode out of sequence. The Phantom Raspberry Blower of Old London Town apart, I tended to find the serials a bit of a slog, so I wasn”t too unhappy when they were eventually dropped for good. I might take a closer look at them sometime, to see if I can pinpoint what works for me and what doesn’t. Do you know what the serials were? I remember Phantom Raspberry Blower, The Worm that turned, and the three Piggy Malone and Charlie Farley series, Death Can Be Fatal, Stop, You’re Killing Me and Ship of Thieves. What were the others? Hampton Wick during series one and Done to Death during series two (the first Piggy/Charley serial) were the others. Series three featured different television spoofs (Star Trek, Jason King and Colditz amongst others) whilst from series ten to twelve the serial format was dropped in favour of one-offs. There were four Piggy Malone & Charley Farley serials: Done to Death, Death Can Be Fatal, Stop You’re Killing Me and Band of Slaves. They always looked expensive to make (especially Band of Slaves) but had a good mix of comedy and mystery.